"The First Thanksgiving 1621" by Jean Leon Gerome Ferris, circa 1912. Last week, as American families gathered around their traditional thanksgiving tables, and then, perhaps their traditional television viewing of the Detroit Lions' annual shellacking, the internet was rife with blogs and articles about thanksgiving. These days, just about anything provides occasion for critical thought pieces suggesting that everything we think we know is wrong. In the midst of all of the facebook posts and shared links, good pieces can slip through the cracks. I saw two pieces in particular that piqued my interest. The first was a New York Times piece with the sensational headline, "Most Everything You Learned About Thanksgiving is Wrong." The second was a piece in the Washington Post by Christian philosopher James K.A. Smith titled, "The NFL's Thanksgiving games are a spectacular display of America's 'God and country' obsession" (I will return to Smith's article at the end of this post). The first article turned out to be an underwhelming, albeit necessary, reminder that the mythology of "the first thanksgiving" often obscures the reality of thanksgiving. 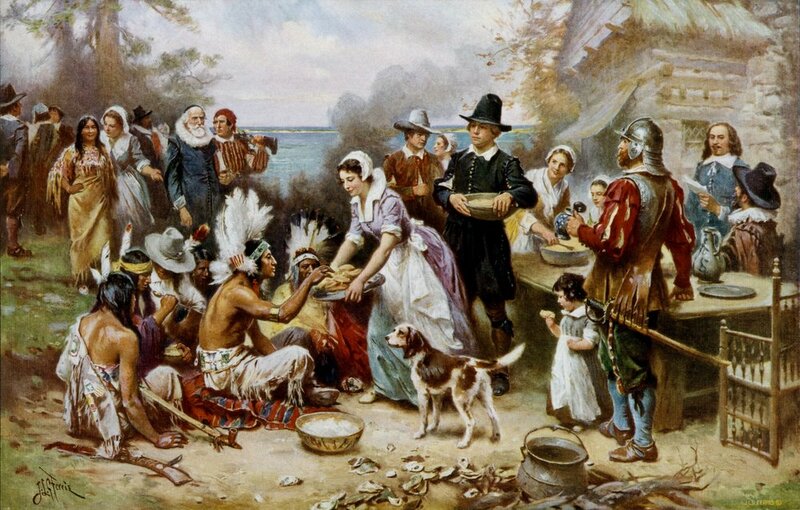 For one thing, the tradition of thanksgiving preceded the puritans' voyage to the new world. For another, there were many different uses of days of "thanksgiving" in New England, the most common of which was the fall harvest, which became the traditional day of thanksgiving we know. The most important point, however, was merely glossed in the NYT piece. And that is this: that the national holiday "Thanksgiving" that you and I know was called for in 1863 by Abraham Lincoln after Gettysburg. Indeed, the connection between thanksgiving and the Civil War is so crucial that we do not really understand its place in the American imagination without further reflection on this point. A while back, I blogged about white supremacy, using American religious historian Mark Noll's important work on the Civil War and Civil Rights to reflection on the enduring problem of white supremacy in American evangelicalism. 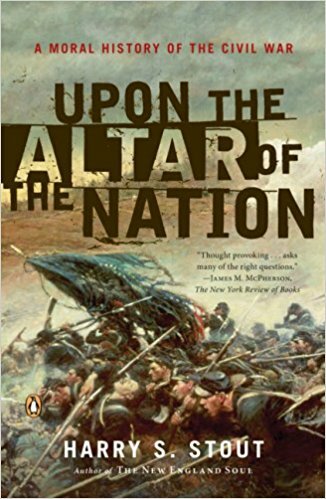 Subsequently, a reader suggested that I read Harry Stout's award winning book about the Civil War, Upon the Altar of the Nation: A Moral History of the Civil War. When I pulled it off that part of my shelf that is reserved for books bought with good intentions and quickly forgotten, I discovered that it was a timely Thanksgiving Holiday read. The main thesis of Stout’s work is that the Civil War was such a gruesome event in the history of America that it requires the creation of a uniquely American civil religion in order to to morally justify the war. In order to understand what Stout means, I must say something briefly about civil religion and just war theory. From there we can move forward to appreciate Stout’s description of the origins of American civil religion in the Civil War. Finally, we can fully appreciate the role that Thanksgiving plays in the American moral consciousness. The idea of an American civil religion originates with sociologist Robert Bellah who, in a 1967 essay, proposed that America is not a "Christian nation" so much as a nation that operates with an "elaborate and well-institutionalized civil religion" that is "rather clearly differentiated" from Christianity. As such, American historians and sociologists ought to treat their subject matter in the same manner as one would treat a religion. The contours of this civil religion, Bellah goes on to explain, are a civil discourse that speaks of God but not Jesus Christ. This God is a unitarian, law-giving deity who providentially guides America to its divinely appointed place in history as a chosen nation, a new Israel. Bellah argues that you specifically see this rhetoric in the vision that America's presidents cast in their inaugural addresses. Civil religion was not originally intended to supersede or replace Christianity; instead, it was the inevitable result of the separation of church and state. With the Civil War, civil religion grew in significance as the nation sought to make meaning out of tragedy. The rhetoric of clergymen, newspapermen, and even Lincoln himself, became focused on encapsulating the horrors of war within the larger narrative of America's providential history (out of the Egypt of European monarchy) and its God-given manifest destiny (into the Promised Land of America). In this vein, notions like blood atonement and sacrifice, repentance, redemptive suffering, and rebirth all took on new meaning, positing the Civil War as a return to Jesus moment in America's life with its higher power. The ultimate result of America's civil religion is a contemporary America with a well-oiled civil religion machine chock full with holy days, national shrines, religious totems, sacred hymns, prophetic leaders and messianic martyr figures, etc. The flag becomes the religious totem of the nation, a sacralized object that cannot stand to be profaned; the "Star-Spangled Banner" and "God Bless America" hymns of worship that must be respected if not outright adored; Memorial Day, the 4th of July, Veteran's Day, and the like, all become holy days set aside for religious observance to remember the nation's past struggles and successes; presidents become prophets, calling America back to its Israel-like sense of purpose in the world as God's chosen nation; and finally, shrines are erected to America's greatest prophets, with the Lincoln Monument becoming, perhaps, the ultimate monument to a messiah-like emancipator (who, coincidentally, was assassinated on Good Friday). There is much more that can be said about this sociological concept. Since Bellah first suggested the idea in the 1960s, the theme has been significantly developed. A few years back, Christianity Today offered a succinct summary of the phenomenon (available here). But Stout will develop the idea in great detail in tandem with his treatment of the Civil War, so I will leave this point for the moment in order to introduce a second, but equally important, aspect of Stout's argument: just-war theory. Within the Christian tradition, there is a long-standing argument that under certain circumstances, war may be considered "just", or, within the boundaries of what is considered legal and moral. Usually, Augustine is attributed with the original argument, while medieval theologians like Bonaventure and, more frequently, Thomas Aquinas, are cited as early representatives of the modern theory. This cartoon, first published in the National Catholic Reporter (according to this blogger), hints at the larger debate within Christianity as to whether or not Just War Theory is consistent with the teachings of Jesus. Christianity also has a very large pacifist tradition that includes Anabaptists and number of Roman Catholics. Perhaps the classic treatment of the matter is Ramsey and Hauerwas's Speak up for Just War or Pacifism. Just War seeks to address two main questions: when is it just to go to war? (Jus ad Bellum) and when at war, what is just behavior on the part of the warrior? (Jus in Bello). In the first instance, the principle of Jus ad Bellum claims that a war is considered just if it is in the service of a just cause. Further, it must be waged by a legitimate authority and with a righteous objective in mind. Even in these circumstances, however, war is permitted only if all other attempts at peace have been exhausted, if there is a reasonable chance of success, and if more good than harm is likely to result. In other words, even if the cause is just, if the likely result is failure or a disproportionate loss of life, then war is not permissible. The calculus involved in the decision to go to war is intended to require a great deal of moral reflection on the part of the warrior, requiring that Christian warriors be deeply thoughtful and judicious before they conduct war. (I tend to agree with Daniel Bell's argument that in practice, Just War has become a "checklist" that has permitted somewhat thoughtless and amoral belligerence). In the second instance, the principle of Jus in Bello (Justice in War) limits the nature of warfare itself. A strict distinction is drawn between combatants vs. non-combatants and military vs. civilian targets, and limits are set to what is considered "collateral damage". Military objectives can only be pursued if the good that is obtained is proportionate with the loss of life that is likely. Further, warriors must be held accountable for their actions. Transgressions of the principles of proportionality and discrimination must be punished so that the overall war effort remain just. For Stout, the Civil War represents the breakdown of all moral reflection on the conduct of the warriors themselves who had to unlearn all of the lessons on honor and justice that they learned at West Point. The slow transformation from civilized rules of war into total war forever altered the American consciousness. The clergy, politicians, and the press all joined a chorus of Americans who clamored for victory without recourse to the methods or costs. Men who stood by older military codes of conduct and honor, like George McClellan, were humiliated for their prudence and ineffectiveness while men who quickly abandoned their West Point code and blurred the distinction between military and civilian targets, like Sherman and Grant, became icons and heroes of the Republic. But the adoption of a total war policy, which permitted injustices in the waging of war, required an overemphasis on the overall righteousness of the cause for war itself. For that to happen, everyday Americans needed an altered religious consciousness in order to make sense of the unprecedented loss of life and destruction. Ultimately, that meant a heightened sense of civil religion and a deep commitment to the idea of America as a people of destiny. The Civil War, according to Harry Stout, "differed so profoundly in scale from earlier American conflicts that participants could only understand and experience it as something totally new and unprecedented". That something new is the dawning of the "total war" that would become more common in the 20th century–wars that would eschew the distinction between battlefields and urban centers, militants and civilians, etc. Sherman's march to the sea and Grant's excursions into Mississippi are exemplary in this regard. These military campaigns intentionally abandoned traditionally military strategy. These armies were able to cover a lot of ground quickly because they didn't worry about establishing supply routes that required securing larger geographical spaces. Instead, these armies lived off the land, taking what they needed at will from local populations and often destroying what they did not use in order to prevent benefiting the enemy. The story of how the Civil War began with 18th and 19th century European military strategy and mounted assaults on enemy lines at Manassas and ended with the total war of Sherman's march to the sea is the story of how the Civil War marked a distinctive shift in America's moral and religious consciousness. From the start, war was something that both Northerners and Southerners agreed must require justification. In the North, that justification ultimately came from the first shots fired. With the assault on Fort Sumpter, Northerners argued, the South had become the aggressor and the North had no choice but to respond in defense. Southerners employed a similar calculus, citing not the first shots fired but Lincoln's order to resupply the fort after South Carolina had already seceded from the union. On these terms, the northerners became the aggressors by violating South Carolina's sovereignty and acting with belligerence. Both arguments are a little exaggerated; however, the mere fact that each side sought to justify war demonstrates that there was, at the outset, a common sense of morality that dictated the grounds and conduct for war–namely, just war theory. The justification for war was established on sifting sand, beginning with claims to defensiveness and constitutionality and transforming into religious claims about the nature and destiny of America itself. We are on tricky ground when we claim that the Civil War was a war about slavery. Do not misunderstand me, it certainly was that (there is no room for equivocating on that point today in light of recent troubles). But in the south, where it most certainly was about the peculiar institution, the terms were set around the question of state's rights and federal over-reach into the western territories. In the north, there were certainly abolitionists who harangued the morality of a war fought to end slavery, but Lincoln refused to allow such language to account for the purpose of military action. Lincoln knew that slavery was written into the Constitution and that a war fought on those terms would play into southern claims that the government had illegitimized itself by acting contrary to its own rule of law. For this reason, Lincoln intentionally spoke about the war effort as a war to save the union. This pressed the idea of "America" to the forefront of the war from the very beginning. As the cost of the war became more gruesome, resulting in loss of life far greater than either side initially believed possible, and the scope of the war grew from limited military excursions into the all out total war of Sherman's march, both sides had to justify the cost in terms that rendered such great casualties to be "moral". Those terms became the religious language of "sacrifice" and "redemption" with the nation (both the United States and the Confederate States) becoming the sacred purpose. The Confederates morally justified their nation by touting themselves as a Christian nation. They pointed out the relative lack of reference to God in the US Constitution and demeaned the founding fathers as "deists" who established the US government under the influence of "French" philosophers. The Confederate States, in contrast, produced a constitution that made explicit reference to both the Christian God and to Jesus Christ. Some Northerners agreed with this assessment; the northern theologian Horace Bushnell argued that the US needed to return to God and to add specifically Christian language to its national documents. This eventually resulted in the motto "In God We Trust" appearing on US coin or currency for the first time in 1864. Other Northerners were staunch abolitionists and believed that nothing would morally justify the war short of total emancipation of slaves. Most Northerners, however, following Lincoln's lead, cast the war in terms of God's divine providence for the union. The new American Israel represented the cause of freedom and justice in a cosmic dimension. The failure of the union was nothing less than the failure for Divine Providence to establish itself on earth. In order to press the moral significance of the war, Stout argues, both Northern and Southern politicians, clergymen, and journalists all spoke of the war and its results in terms of divine providence and human supplication. Each victory was proof of God's endorsement of their just cause and each defeat was proof that these Northern and Southern Israelites had not been faithful to their covenantal God. And this is precisely where the idea of Thanksgiving comes to the foreground. In both the North and the South, clergymen and politicians made a regular habit of calling for days of fasting and days of thanksgiving. Days of fasting were often used as opportunities for citizens to gather in their local congregations and to repent for national sins. These often occurred in the wake of great military losses. The result was to reinforce the suggestion that God's providence was guiding the nation (again, both the USA and CSA) towards its ultimate destiny but that these momentary setbacks were meant to call the people back to faithfulness to God. Alternatively, days of thanksgiving were called in the wake of victories in order to give thanks to God lest the nation forget God and find itself once again facing defeat. In the North, these events were irregular and regional. Most commonly, they occurred in New England because the pattern of fasting and thanksgiving originated with the puritans and was a somewhat established pattern of life (although by this point it had become irregular before the war). In the south, it was more common for the government to declare days of fasting and thanksgiving and for Jefferson Davis himself to regularly worship at an Episcopalian church in Richmond–he even converted and was baptized during the war. All of this reinforced the Southern image of a Christian nation at war against an atheistic aggressor. When President Lincoln called for a national day of thanksgiving in 1863, he was taking up a traditional New England thanksgiving celebration–the harvest celebration–and imbuing it with new meaning. The national day of Thanksgiving, in effect, became America's high holy day. Instituted to give thanks to God for victories in Vicksburg and Gettysburg–victories that undoubtedly turned the tide of the war and delivered Lincoln a second presidential term–the national day of Thanksgiving became an opportunity for a nation of destiny to give thanks to its divine provider. It also became a foundational piece of American civil religion. Every year, Americans gather together to give thanks (sometimes to God, sometimes to each other, sometimes to no one in particular) for the mere fact of America's existence. That America continues to exist year after year is taken to be a sign that its God continues to control its destiny. Even the retrospective labeling of the Puritans as "pilgrims" formally establishes America's origin as a nation founded by God's people, the New Israel, who made pilgrimage to the Promised land. Part of that thanksgiving ritual is the recognition of the freedoms that we enjoy and the sacrifices that were necessary to make those freedoms possible–a point that has become reinforced by the addition of other holy days to the American liturgical calendar, Memorial Day especially. This is why the theological ethicist Stanley Hauerwas has argued that war is America's central liturgical practice. America best knows who it is and what its destiny is when it is at war. It gains its sense of morality and purpose from the act of war itself–war is just when we do it and our cause is good, therefore providence will not permit us to fail. Nothing unifies the nation like war.Thanksgiving is the high holy day of all the holy days because it is the only one that continues to specifically invoke the vague notion of divine providence. It is the one that gives America is deepest religious impulses and comes closest to eschewing the difference between church and state. The nation that prays together stays together. It doesn't really matter what or who you think you are praying to, but that you participate in the corporate worship of the nation. Furthermore, thanksgiving is an enduring reminder of the success of America. I have already hinted at the idea of liturgy with the suggestion that American civil religion has its own liturgical calendar that rivals the Christian calendar. Hauerwas's suggestion that war is a liturgical act plays into this idea with the liturgical holidays often functioning as ways of institutionalizing and celebrating the meaning of war in times of peace. But James Smith's Washington Post piece (referenced above) probably goes the furthest in suggesting how the contemporary liturgy of thanksgiving works. This is not surprising since Smith has just completed is wildly popular three-volume "cultural liturgies" series with his much anticipated Awaiting the King. [An overview of the main point of his three-volume series is available in the more accessible book You Are What You Love.] Central to Smith's work has been to suggest that our lives comprise a number of overlapping "secular liturgies" that form our character, many of which compete with Christianity and ultimately undermine the formation of Christian disciples. In this WaPo piece, Smith applies his concept of secular liturgy to Thanksgiving, pointing out that the confluence of religiousity, consumerism, and football tells us what America really cares about. The NFL particularly, according to Smith, demonstrates a civil religiosity by its overt recognition and thanksgiving to the military. This year, the NFL has been in the news a lot on account of NFL players who have decided to protest the playing of the National Anthem in order to point out the ways in which America fails to live up to its idealized representation of itself. Eric Reid and Colin Kaepernick kneel during the National Anthem before a game against the Los Angeles Rams on September 12, 2016. If nothing else, these protests have exposed the underlying religiosity of America. These men are not Protestants, they are heretics. They profane the sacred image of the flag and the sacred hymn of the national anthem. The charge that they disrespect the honor of those who died for that flag invokes the imagery of sacrifice, suggesting that to protest the flag is to protest America's saints–military heroes of old whose blood was sacrificed for their freedom. It is the American equivalent of disrespecting Christ's sacrificial atonement for the freedom of sinners. That America has taken such a focal point in the American moral imagination is unchallenged; that Black NFL players would suggest that not everybody has the same experience of America's providential path and the purported freedoms of its people undermines the very sense of morality that makes the loss of military lives meaningful going as far back as the Civil War. These deaths were rendered meaningful by moralizing the idea of America itself. To call that into question is to call into question value of those lives that were given in its name. Football is particularly suited for the holiday of Thanksgiving. IF the modern practice of Thanksgiving really gains its intelligibility against the backdrop of the Civil War and the idea of America's manifest destiny AND if Hauerwas is right that war is America's central liturgical act, THEN football is an act of worship. American football slowly developed into its modern form between 1869 and 1880, when Walter Camp first recorded the rules of college football. In the wake of the Civil War, the American version of football developed an unmistakable similarity to war. Offensive and Defensive lines were established, with the conflict between them being waged in the "trenches." Advances occurred by attacking the line in the center or trying flanking maneuvers. Running Backs and Wide Receivers emulate cavalry, moving quickly around the main lines of attack to gain strategic advantages; the passing game emulates artillery, bombarding the enemy behind the lines, probing for weaknesses; and of course, the quarterback functions as the field general, directing the action, moving the line of attack forward when possible. If Thanksgiving was originally intended to celebrate God's providential preservation of the union of the United States, then football is the means by which the Civil War has been memorialized in the American imagination. That is why Smith's suggestion about the NFL is particularly relevant. Of course, the closely related liturgy of Black Friday adds a significant capitalist element to the American liturgy of Thanksgiving, but that is a matter that must be addressed on its own terms. I hope to write about American Evangelicalism and Capitalism at some point soon, but that requires a lot of writing and thinking on my part.